Deputy President Cyril Ramaphosa is accused number one, according to Dali Mpofu. For the commissioners, however, finding Cyril caused the massacre might be a leap too far as lawyers are still trying to convince them the police killed real people and not a faceless mob programmed by muti to attack cops. By GREG NICOLSON. Ramaphosa joined President Zuma on stage to cheers from ANC delegates in Mangaung. He won the race for deputy president in a landslide victory. In the two years since, he has emceed Nelson Mandela’s funeral, was a leader in the party’s election campaign, and became deputy president of the country. He’s trying to resolve the Lesotho statement, has led state delegations to Uganda, South Sudan, Ethiopia, Tanzania, Mauritania, Zambia, France and Sri Lanka, and is the go-to man for speeches Zuma cannot, or doesn’t want to, deliver. This is all after Ramaphosa was accused of causing the Marikana massacre. On the second day of the Commission in October 2012, lawyer for the injured and arrested mineworkers, Dali Mpofu, announced that a “toxic collusion” between police, Lonmin and the state led to the killing of 34 people on 16 August. “At the centre is a gentleman called Cyril Ramaphosa,” he told the world. The allegations against Ramaphosa have hardly impacted his public life, except when the Economic Freedom Fighters call him “Buffalo Head” and a murderer. But in closing arguments on Wednesday, Mpofu named the deputy president Accused Number One: “If you are not going to charge Mr Ramaphosa, don’t charge anybody.” His argument relies on a series of events and their consequences. After the violent Impala Platinum strike in early 2012, which calmed after Julius Malema addressed workers, Lonmin took a decision not to negotiate if its employees do the same. So when rock drill operators began an unprotected strike in August, the company turned to Ramaphosa. The situation quickly got violent, with five people killed over a weekend. Instead of negotiating, Lonmin asked Ramaphosa, a non-executive director with ties to the top of the ANC, government and National Union of Mineworkers (NUM), to get police to put an end to the violence, allowing operations to continue without talk of wage increases. So Ramaphosa called Police Minister Nathi Mthethwa and Mineral Resources Minister Susan Shabangu. He got them to classify the strike as criminal rather than a labour dispute. More police were deployed, bringing a mindset of “shoot to kill” and “fight fire with fire”, argues Mpofu. 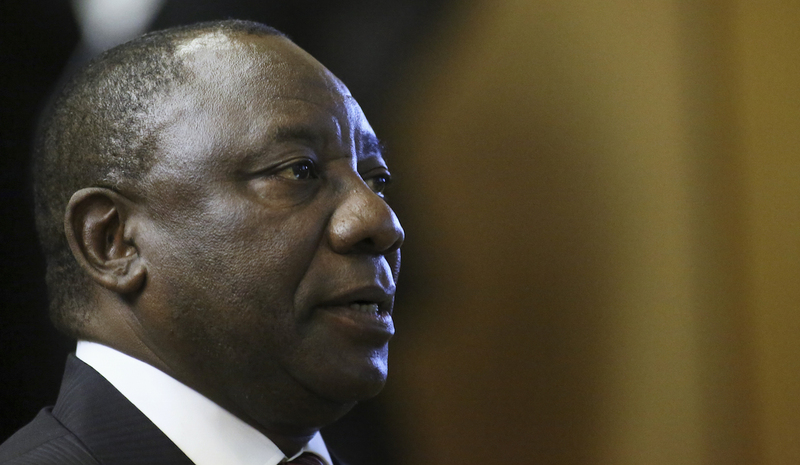 In an email to Lonmin acting head Albert Jamieson, Ramaphosa said, “They are plainly dastardly criminal and must be characterised as such.” He called for “concomitant action”, “containing the situation” and to “act correctly”. Ramaphosa’s message filtered down to police commanders. In a transcript of a conversation two days before the massacre between North West Police Commissioner Zukiswa Mbombo and Lonmin executive president for human capital and external affairs Barnard Mokwena, Mbombo says Ramaphosa was applying political pressure on the police. The pair admits to not wanting Julius Malema to resolve the situation like he did at Impala. “Hence, I just told these guys that we need to act such that we kill this thing,” says the deputy commissioner. That’s the causal link, argues Mpofu. On 15 August, the country’s top police officials then met in a national management forum meeting and decided to disarm the protestors the next day. Commission Chair Ian Farlam said he had been wondering since the inquiry began why police chose 16 August and were fixated on it; it seems the transcript explains it, he said on Wednesday. The decision to implement the plan on 16 August set off events that resulted in the massacre. Ramaphosa has maintained he wanted to prevent further loss of life. In his final submission addressing the allegations, his lawyers explain he had no conflict of interest in intervening, witnesses say he did not apply pressure on the ministers, and nothing directly linking Mthethwa’s intervention after speaking to Ramaphosa to the deaths. Regarding Malema, Ramaphosa argues that the impact the concern had on the SAPS’s decision making is not proven and even if it was neither Mthethwa nor Ramaphosa conveyed that pressure. For Farlam and his fellow commissioners Pingla Devi Hemraj and Bantubonke Tokota to find Ramaphosa caused the massacre might be a leap too far. In their closing arguments many of the lawyers at the inquiry have spent time just trying to convince the commissioners that the strikers are individual human beings. They are responding to the SAPS, which have identified a core group of miners they say are all militant and programmed by muti to attack the police. All the killings, the SAPS say, are justified by the risk posed to cops. “It is important to contextualise who these people are. Who are these mineworkers?” asked Dumisa Ntsebeza for the families of the dead strikers on Tuesday. He wants the police to justify each killing and called for the Commission to recommend criminal investigations into: Brigadier Adriaan Calitz, who led the operation on the ground, Minister Mthethwa, the SAPS leadership that endorsed the tactical intervention, SAPS members of the police joint operational co-ordinating committee who attended the meeting on the day of the massacre and decided to “go tactical”, the commanders of the different SAPS units involved, and the individual shooters on 16 August. Defending AMCU on Tuesday, Heidi Barnes said union leader Joseph Mathunjwa went to great lengths to mediate the matter and avert a face-off between police and protestors but requests for a meeting were denied by Lonmin. Representing the platinum company, Schalk Burger said NUM was the majority union and that agreement couldn’t be broken to negotiate with the rock drill operators. Negotiating with the miners outside of bargaining processes would have had negative and far-reaching consequences across the country. Closing arguments finish this week with NUM, Mthethwa, Shabangu and the SAPS still to state their final cases. The commissioners have until the end of March to submit their report to Zuma, with a draft copy likely to be ready in February for proofing.